I’m so excited to share more of Hazel with you today!! Just after I started this blog we lived south of Cleveland, and while my husband was in school I passed the time driving into Amish country visiting thrift shops and flea markets. I have a small and special collection of vintage fabrics from my time there…some of which inspired Hazel. I wanted this collection to be pretty and feminine, but still have prints and colors well suited for my boys. They also mix great with other collections and basics…which was really important since I love a huge variety of fabrics in my quilts. The blues in this line are my favorite…no surprise there! Hazel will ship to stores in August (a loooong wait but it will fly by!) and when it gets closer I will let you know where you can find it. If you are a quilt shop owner, Hazel is for sale now through your Windham Rep.
:) I'm leaving comments on both sites! LOL! 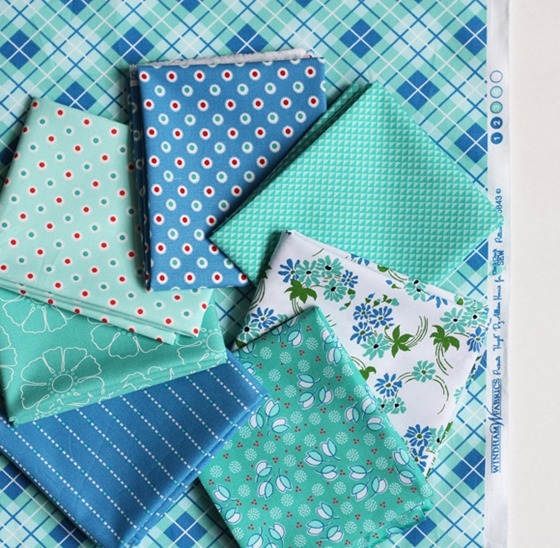 Thank you so much for this lovely giveaway of Happy Hazel fabrics! I love the blues in this fabric collection. I left a comment on your instagram too! Thanks for the chance to win! Hazel is gorgeous! So fresh and happy, yet vintage at the same time! Alison, I love these very fresh and classic! Great job! These look great! Good variety! Congrats! Lovely! Congrats on another beautiful line! I love it. Such cute prints. I'd love to spend a little time in the studio with them!!! I have been waiting for a collection like this with just the right patterns and colors to play with. Congratulations! It looks fantastic! And thanks for the chance to win some…I am crossing my fingers. I love this line! I love the balance between the geometric prints and the florals. So pretty! this is so pretty! thanks for the chance to win some before August! Hazel will definitely be a favorite of 2015 for me. The echo of the old feedsacks is beautifully done and the colors are perfect! I can't wait to sew with your entire collection! It's wonderful! This is exciting. Congratulations. Oh, my, I LOVE this. Great job!! Oh, my! It looks like happiness! Love the florals and the plaids and the all of it! Love, love, love the new fabric! Can't wait! Love this fabric! You did an amazing job! Congrats on the new line! I love it! These are so cute! I love the projects done with them especially the skirt! I was extra ambitious and entered both, but this is so gorgeous I would love to win!! Love the spring feeling I get from Hazel. I love it! The skirt is so adorable too!! Thanks for a chance to win! It's beautiful! Thanks for the chance to win! What a lovely line! The blues are charming together and I always love an aqua red combo. Such gorgeous prints. You are so talented! I love the name of it. You are right, the blues are the best! The colors are wonderful, need them! I love this. The florals especially are right up my alley. Very pretty fabric! And I love that there are basics that could work for boys included too! ;). Congrats! So Pretty. Love the colors! Beautiful fabrics… Thank you for the opportunity to win! I love the fabric so springy. Thanks for the chance. I love your new line! Beautiful! Perfect colors to usher in spring! I like the blues i think the best, but I never make anything for myself anyway so that never matters, lol. I have a new grandbaby coming in a month, I could make plenty of things with this :) I love the ties on your boys, adorable! What a wonderful collection! Great job! I m very impressed by your line and feel you vintagy vibe. That is a beautiful collection of fabric! I love the blues, greens, and reds together! It's a great collection! I can see it working with lots of fabrics too. The florals are so pretty!!!!! Those outline flowers are perfect, think they'd make a gorgeous dress. Congratulations on your fabric line. I'm ambitious! :) Can't wait to get some Hazel. It looks lovely and it will be fun to mix it with Oh Clementine & Wallflowers. Congratulations on a third collection. I'm so happy for you! love your new line – and your old ones :) i still have some wallflowers that i'm using for a dresden. love it. thanks! Oh how pretty! Love your fabrics! These colors are fabulous!!! I love the surprise of peach but the blues are my favorite too! I love this line! It has all my favorite colors and I would love to have an opportunity to use it in a quilt! Love them! Thanks for the chance to win! Beautiful fabrics! I love the flower prints. Great colors and patterns it is going to be another fabulous line. Thank you for the give away. I love every color in this pallet! Just gorgeous! This is a beautiful line of fabric! Thanks! Your fabric designs are perfect. Love all the colors too. Thanks for giveaway! The fabric is great! I like your round pillow! Love your sense of whimsy! I am so loving these prints and colors. Can't wait to come see them in person at market!!! Those are pretty awesome prints! And since I'm always looking for my not so little guy, the blues are terrific! What lovely fabrics, the blues are perfect. ahhhhh, I think the blues are my favorites as well! What pretty fabric. Thank you for sharing. This is such a delightful line of fabric! The blues are fabulous! Thanks for the chance to win. Lovely fabric! Can't wait until August!! So lovely and I like the name! Thank you for sharing with us. Excited to see the quilts! Nice work! Since the moment you first shared this line I was in love. August is going to not come soon enough. Since the moment you first shared this line I was in love, August is not going to come soon enough. The blues are perfect for boys! I'm into turquoise and grey right now, and these look like great additions. Thanks for the chance to win. Oh my goodness!! Yours were the first FQ bundles I ever bought because I fell in love with every one of them…and now I'm so in love with these too! Awesome job (again!)! Thanks for this great giveaway! I love the look of Hazel and can't wait for it to come out!!!! You did it again! Another gorgeous collection, can't wait! Love your new line! Can't wait for it to come out! I love it! Cannot wait for August. Those fabrics are so pretty, what a lovely collection! Thanks for the chance to win some before it comes out this summer! These are great fabrics and I'd love to win. Thank you for the opportunity. For me…there is no single color I love…I love them ALL…your collections are always brilliant in color & design! Your new line looks fabulous! Love the colors and prints! What a gorgeous fabric line! I agree with you on the blues. I think they are beautiful! Ooooh, those basics are yummy and the aqua floral print! Beautiful! Thanks for the chance to win! Love how these fabrics mix with others. A breath of spring. Good luck with Hazel….so pretty and the the colors are yum! 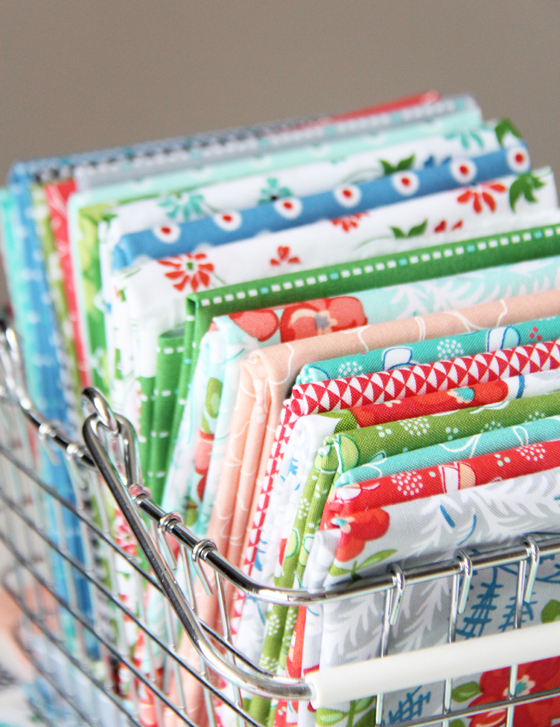 Such a pretty fabric collection! What a lovely collection!! Congratulations!! This is such a pretty fabric line. Congratulations! Fabulous fabric line, looking forward to getting it. I would make Button Up, or Dwell or Pow Wow or…. with it, the possibilities are endless. Love this new line!! The colors are so pretty and so is the vintage vibe. Of course I entered on IG too!! Love the blue line too; such a lovely and versatile collection! Congrats, I love this line of fabric. My fingers are crossed. Love the colors and prints! Great job on Hazel. I love this line! I am a still pretty new to the world of sewing and quilting, and my two little ones eat up most my time, but this cute fabric gives me that itch to create! Thanks for inspiring me! Oh, I see the "vintage" in some of the pretty prints! I believe I have a couple of the same vintage feedsacks that you do! Love this line! Thank you! You have done a wonderful job! I really like the feeling of the Hazel stack but I am especially taken with the blues. I'll be thinking over my Hazel projects until I can get some of my own. Thanks for a chance to get some early! What a wonderful collection! Love the name… I had an aunt named Hazel.. she was a pistol! Very nice! It'd be perfect for projects from Lori Holt's new book. I left a comment on your instagram, too. These are so beautiful! Happy Hazel would make me happy, too! Wonderful colors and patterns. Love them all, but agree that the blues are the best! Wow, love, love, love Hazel! So pretty! I'm so excited for this line! the fabrics are beautiful. thank you for the opportunity to win them! Congrats on the fabric line! Love, love, love this fabric line!! Can't wait to get my hands on some in August!! Oh yaaay! It is so pretty. I find a good green and a good red are my hardest colours to find. I will be looking for this in Aug. I love, love, love the aqua! Keeping my fingers crossed I win. Thanks for the opportunity. Great thinking to include colors/prints suitable for boys and girls! I love the wide variety of colors and prints in your collection! Congratulations on another fabulous line! Love the fabric! IT HAS A REAL VINTAGE feel and is still fresh! Can't wait to work with it! Gorgeous! So vintagey. And that green!! I love the fabric! Such beautiful colors and designs. Beautiful fabric! I can hardly wait to see it in person. Beautiful fabrics. I love the addition of some more "boy"-like colors and prints to go with the flowers. Love all the fabric! Can't wait for the release! Love the colors and they are vintage-y and cheerful! I would love to win some—I would make a "Sew Together" bag to carry in my knitting bag. I love the colors and designs! What an adorable fabric collection! Thank you for your wonderful blog and patterns. I love the blues too. Gorgeous. What a gorgeous bundle! I too love the blues. And the boys with ties! I've got three boys and they always find something to mess with their brothers.and they're all grown up now. Such a beautiful fabric line!! I would love to win it and sew with it!! So pretty! It's neat how you thought of including boyish prints. Those can be difficult to find. Very clever idea to include prints that can be used for boys. I love the prints and colors. Lovely line of fabric. I think you got a great balance of the sweet with something for the boys. Great work! Thanks for the chance to win. Beautiful fabrics!! Those are very sweet fabrics, and a great palette. Thanks for the links to projects. Those are a great mix of boy and girl prints. I can't wait to get my hands on some. ;) I can picture them in a cute Father's Day tie quilt. How pretty is that? There is something so special about fabric! Love it! The blue argyle will work perfectly in a project I'm planning for a friends son. Lovely collection and I can see why you are excited. What a gorgeous line! Congrats!!! Love the new line! So excited to see the quilts. Beautiful fabrics. Thank you for sharing! Beautiful!!! I would love to win! Thanks! 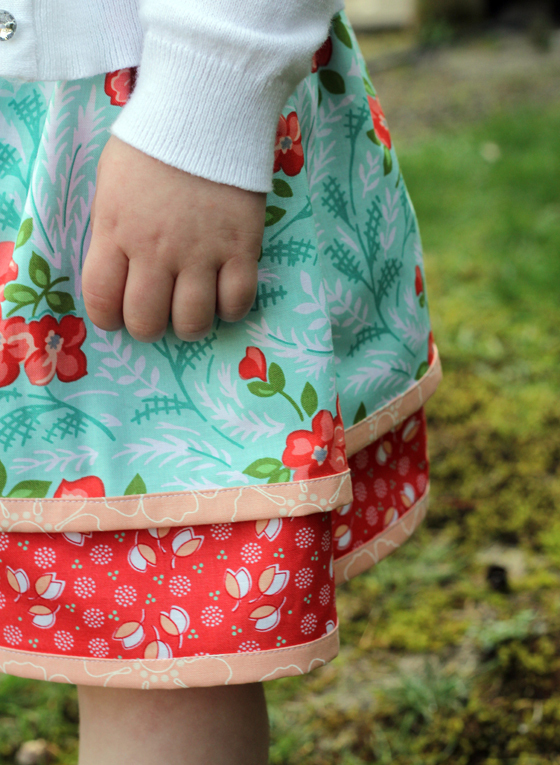 I "sew" love Hazel–beautiful collection of fabrics! Your Hazel Collection reminds me of my Grandma and all the wondrous things she created. But her name was Jane. I love the fabrics in this new line. I have the perfect project to use these for. Thank you for the chance to win! This has to be my favorite line yet. Love it! I love Hazel already! 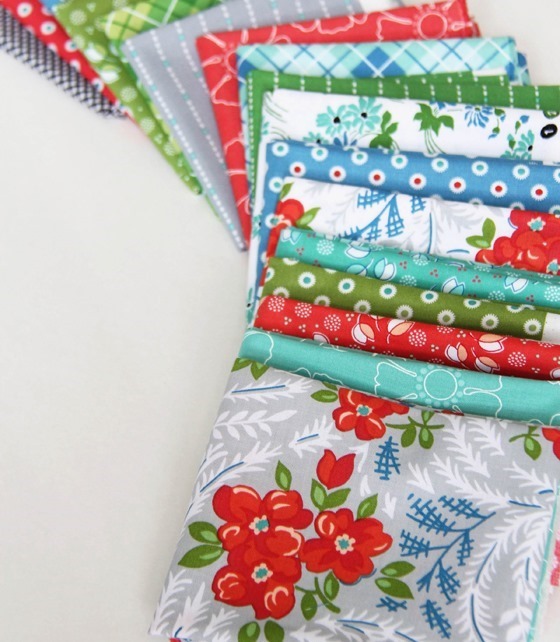 Thanks for creating another gorgeous fabric collection, Allison! I'm really taken with the daisies with the curved stems and the lines of squares. Actually, I like all the designs and the colors. Great fabric range! I love these. They definitely remind me of feedsacks which is totally charming. So much fun to see more pics! Love it-please tell me you named it after my grand daughter 😂😂 !! Love these colour combinations. Very fresh and vibrant. A beautiful collection, love the blues, love the large outlined flowers, great job -well done! I might just have to break my fabric diet for this collection! I would love to win those fabrics. Just looking at the stack makes me happy! I love this fabric, it's fresh and modern with a perfect touch of vintage. Hey Allison, I'd love to play with some of your Hazel fabrics! I just finished stitching a quilt for Karhy O. out of your Oh Clementine fabric, so it only makes sense for me to move on to Hazel now – right? :). Looks like a great collection – congrats! Lovely patterns…I am a fan of the Reds! My grandma's name was Hazel. I love you Hazel fabrics and really need to sew a tie for my son. Thanks for the chance to win. What a beautiful collection. Hope I win. Beautiful fabrics! What a great collection! Oh, I would just love to win these. I really enjoy your fabrics and patterns. I'm waiting for this line to finish my quilt. I like the aqua floral print best! wow…. look at what a fantastic fabric designer you have become! So proud of you Allison! What a beautiful line. I love that it has a vintage sheet feel without having to scour thrift stores for them. Love love love. Love this fabric collection. I particularly like its versatility – suited to boys and girls. Well done. The fabrics are so pretty! They look like spring. What lovely fabric! I think the blues are my favorite too. Thanks for the chance to win! Wowsers! Can't even figure out which print is my fave. They are all beautiful!! Love them all mixed up together. Can't wait to see your quilts! Oh, I working on a sampler quilt right now and these are the colors in the quilt! I NEED some of Hazel. I love those blues too – especially the plaid! Thank you so much for the adorable tutorials, although I'd love to win the fabric (because it's adorable) I feel we already have with the patterns you've provided. Thank you again! Beautiful blues, and reds. It's all beautiful! Beautiful collection. I especially like the more aqua blues. Beautiful collection! Thank you for sharing. Such lovely fresh colours! Thanks for the giveaway. I love the ties. Fabulous fabric and those boys are wonderful, too. I really like the colors – bright but not overpowering. Do I dare say your sons are adorable? Such cute and impish smiles. Congratulations on your new fabric line. I love the things you have made with it. lynnmcindoe at gmail dot com. I love your new fabric line' Hazel! The colors and patterns are beautiful. I certainly look forward to having it available in August. In the meantime, thank you for the chance ! I think a lot of us are feeling ambitious, leaving comments on here and on Instagrm, because we love your fabrics sooo much!! Lovely fabric and great giveaway! I love these fabrics!! Thanks for the giveaway. Hazel is a beautiful collection! It will blend well with my stash! Thanks for sharing! Love the new collection. Thank you for the giveaway! Beautiful fabrics! I love all of them! What a beautiful collection! Congratulations! Love the fabric. Thanks for a chance to win. Congrats! It's just lovely….such a variety! Thanks for the opportunity to win. All the best…. Lovely collection and my eyes were drawn to the green and blue fabrics. Hi Allison. Gorgeous fabrics in all my fav colours, especially liking the greens for a pop of spring now the sun is shining. I'd love to win this line, not yet out here in the UK. Here's hoping and thanks so much for the chance! The blues are my favourite too! These patterns and color are beautiful. Congratulations on a beautiful new fabric line. I'd really love to get these beauties early! Beautiful fabrics. Thanks for the chance to win. I love Hazel! It is so fresh! Such a beautiful collection! I really appreciate the chance to win. So exciting! Gorgeous colors. I love the way they all look together. Love the line-it is SO beautiful! Your new line is one that will be flying to quilters homes! It reminds me of Bonnie and Camilles line in a way but yet unique! I really like it and suspect I'll be getting a bundle! The colors are yummy! Very pretty fabric! Thanks for sharing. I love the colors and the prints – all are in the ranges that I am drawn to have on my stash. Beautiful, I like the blues and green. Would love to sew with this. Beautiful collection. Very like feedsacks. I love the blue and aqua. Thanks for a chance to win. Each of your fabric lines is so fresh and upbeat. Keep it up! This fabric begs to be made into a lap quilt that can be pulled out to brighten anyone's spirits. Oh so pretty! I love the gray you added, it looks so great with the rest the pretty colors. Beautiful fabrics! Can't wait to get some and do some sewing! So bright and cheerful! Seems this year I'm drawn more and more away from my "norm" and lovin things/fabrics outside of my lil box! Thanks! Your Hazel line is beautiful. You did such a lovely job with them. I can't wait until they are available. Oh I loves the blues too! Allison your sons are too cute! Ohh, Pick Me! Pick Me! I love this palette, especially the blues! Wonderful fabrics! Would love to win! Your new collection is gorgeous! I also love the blues, especially your mix of on-florals. Perfect. I'd love to win a bundle of this fabric. Thanks for the offer. Your fabrics are always beautiful! Love this fabric by Windham. Some fabrics just 'speak' to us – and that is how I feel with this one! Thank you for this giveaway chance :)! Beautiful line. You did a great job! Thank you for this beautiful giveaway – your new collection is AWESOME! :) Congrats!! I love the colors in this line! Beautiful. Would love to create something from it! What beautiful fabrics. Yes, the blues! so cute! I'm a sucker for aqua with red!! I love the aqua prints, but the whole line is beautiful. congrats on another wonderful – versatile – line. I'd just love to win. Gorgeous designs! Congratulations to you! Oh my gosh, so beautiful! Can't wait for August! Pretty! Thank you for the chance to win! These are beautiful! I really like the stripes! Hehe the blues are my favorite too! They would go great with some fabrics I have pulled for a someday quilt. Beautiful collection. And your middle son cracks me up! Beautiful colors! These would mix well with my 30s fabrics. Thanks for the chance to win a lovely bundle. What beautiful colors and designs! Your fabrics are lovely! I too would chose the blues as my favorite. You have another great collection! Love the collection! I'm always drawn to modern vintage! Hazel is crisp and fresh and very, very pretty!! GORGEOUS! Lovely colours and patterns– a bit modern and a little vintage and a lot cute! Stunning colors and patterns – congratulations! This is SO lovely! I'm really excited to see it in person! Oh my gosh, I love the blues. Such beautiful fabric! SO SO PRETTY! I do LOVE the blue fabrics, and the greens – well, all of them! Can't wait to get my paws on a bundle! Thanks for having a beautiful blog, full of inspiration! Beautiful fabrics. Thanks for a chance to win! Just in time for spring! Thanks for a chance at such a generous collection! Love the fabrics, especially the blues! oooo so pretty… and sweet and simple. a great collection! Congratulations on you new line. It's beautiful!!! Can't wait for this gorgeous fabric to become available – it's so hard waiting! Wonderful blend of colors. I think I like the green the most! Thanks for the chance to get some of your beautiful fabric. How could you tease us in April about beautiful fabric not available until August?!?! :) Congrats on another line of delicious fabrics! I love it Allison, the whole collection! Can't wait for it to be available in stores. I guess waiting gives me time to finish up some projects though. Omg I love this fabric! some of that lovely eye candy! I love all the colors. You have a great eye for color, I'm excited for them to come out! I hope I win a F8 bundle! I think this would ne great fabric to use with my new Lori Holt book, Farm Girl Vintage! Thank you for cutting into your samples for us. I've been noticing glimpses of this new collection in earlier posts. It's looks even more beautiful now that all the prints are displayed together. Thank you for offering the giveaway. Love those beautiful colors! Great job! Can't wait til august! I would love to add this to my stash! Absolutely adore this Hazel line and would love to get to see if in my home. Hazel is beautiful!!! I love the blues too. Thanks for the fun giveaway. so great of a collection – can't wait to create with it! Woohoo!! I cannot wait to get my hands on this fabric! Love this colection of fabrics. I would enjoy making the skirt for my triplet granddaughters. I don't often sew more than paper these days. And I am always intimidated by fabric patterns, but can mix and match paper patterns with no trouble at all. I'd love to work with a collection already chosen for me as I try to whip up that gorgeous pillow! I love this line and I love that you named it Hazel. So cute and vintage. Thanks for including some fabrics for boys! I have three boys and it is sometimes hard to find good boyish fabrics. Thanks for the chance to win! I love how fresh & clean your colors are! I love the fabrics!! — I can see why the blues are your favorite!! Love the aqua and blue together. I am anxious to see your quilts. The skirt is adorable! Thanks for the opportunity. Love it! If my daughter was 6 instead of 26, I'd be making that skirt for her. What pretty fabrics. Love the ties for your boys. Love, love, LOVE this fabric collection–the possibilities are endless! Congrats on the beautiful fabric line. Love the modern twist and vintage look. They should play nice with some of the older fabrics in my stash. These prints are so pretty! But I'm tearing up because my grandmother's name was Hazel. She passed nearly 15 years ago, but I think of her from time to time. Funnily enough, I can see her wearing that blue plaid print or the red floral on gray as a blouse, and I love the geometric blenders and the flower sketch prints. Now I have a smile on my face thinking of her, and all because of your beautiful fabric!!! Such a lovely fabric line. The modern vintage vibe is just my thing! I love the fabrics. They look so fresh and fun. August is way too long to wait! I love this fabric. My favorite colors and the vintage feel. Thanks for the chance to win. I love Hazel! Thanks for the chance to win. Lovely fabric, thanks for the opportunity to win! Congratulations on launching another great line. Fun colors and prints! Love the ties!! You are indeed a blessed woman to have such awesome and handsome sons! Enjoy!! Love this line and would love to sew with it! Thanks for the opportunity. Love your new line and the blues are my favorite also. I love this collection ~ Reminds me of days growing up (So I am vintage :0). Thanks for this great giveaway and congrats on this collection! Love the colors and the details on the prints. Beautiful collection! Can't wait to see your quilts. Sweet fabric ~ especially like the plaids! A lovely new line – so pleased for you! I love this line. The colors work so well together and are just my cup of tea. Congratulations, beautifully done. This line is beautiful! I especially like that it is bright and joyous and still great for boys. Can't wait to get some! I love that there are feminine and masculine prints in this line. Wonderful line! Thank you for sharing. Beautiful! Love those minty greens and blues with red. Such great colors & prints! Such a nice collection. I agree, the blues are my favorite, too! Such a lovely collection – well thought out in palette, scale, and print motifs. Well done! It's beautiful! I can't wait to get my hands on some! What a beautiful collection! I love love love it- well done and congrats!! Love the collection and the name! Can't wait to get my hands on them. I am somewhat weary of the aqua/red combo, BUT YOUR LINE IS AWESOME!! I LOVE these prints!I have six grands now, and four are boys, so this would be great if I win. Those blues are perfect. Love, love those springy fabrics. Hazel is gorgeous. Thanks for the giveaway. This fabric is absolutely beautiful! A vintage look and yet so fresh and pretty. Love it. Thanks for the opportunity to win! Love the colors in this line! Such beautiful coordination of colors and prints! Nice work. Love love the name of the collections and the colors just make you want to smile! Very pretty and fresh prints–perfect for spring!! What lovely fabrics! The colors are just PERFECT! Thank you so much for the chance to win! Nothing would make me happier then some of those yummy Hazel fabrics. Beautiful job! I like! I used to live just south of Cleveland and used to enjoy driving to the small quaint towns scattered around Ohio. Your Hazel line looks like it will pair well with your last line…can't remember the name of it…something to do with wildflowers? Anyway, I have a stack of that line waiting for the 'perfect' project! i love the blues!! what a beautiful line. congrats! Bright and saturated color. Perfect! Hello! I love the prints in this collection and would use the pinks in a baby quilt. The flower print looks vintage, like a tablecloth fabric my grandmother might have had. Thanks for a chance in the giveaway. Love this bright and cheerful collection – it makes me smile! And thanks for the opportunity to win! I love this color palette. And I had a Aunt Hazel – what a great name! I love the blues too! The whole line is beautiful though. Can't wait! Fabric is awesome! I love the red and aqua color combination! So Cute. Great job on your new line and I would love the chance to play with the new fabric! So pretty Allison! It must be so much fun to create your own line, and then create your own quilts and projects. Love the pick of your sweet little girl's hand, aww, and the boys–! Too funny and such boys. Sweet collection. Congratulations on another nice line up. Congrats …the whole line is just beautiful! Thanks for a chance to win it! What a beautiful bundle and I love the skirt sample you made. I am planning on making a pillow for my daughter's bed and your new fabric line and your pillow pattern are a perfect fit! What a lovely collection of fabrics. I like the round cushion too. August is too long to wait – so I'm crossing my fingers (and heading to Instagram to double my chances!)! Love these fabrics!!! Thank you for the giveaway. sadly I do not instagram so I will put all my eggs in one basket so to speak….here's hoping…..
Oh my! These colors are wonderful, especially the blues. What a great collection! I am especially in love with the blue plaid! As adorable as your daughter! Congrats are in order. Love the color and the looks of texture…looking forward to playing in your collection. I LOVE this collection! The reds are my favorite!! Thank you Allison for the chance to win a collection of your beautiful fabrics. It would be such a pleasant win. Hazel is beautiful and I appreciate a chance to win! So, so gorgeous! Thanks for the giveaway!! Those are really lovely. 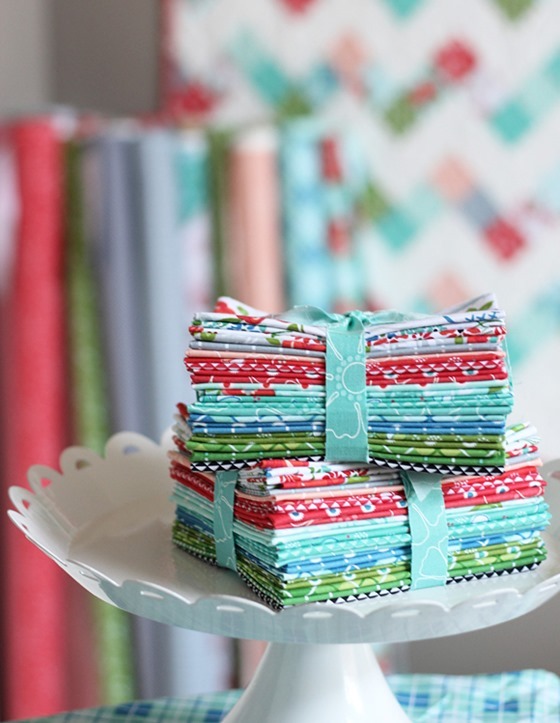 It will be fun to see your projects soon so we can see those pretty fabrics in action! Hi…how funny…I live south of Cleveland…in Parma, to be exact. I'd love to win these fabrics…thanks so much for the chance & congrats on your new fabric line! Love this line!! It's beautful, I can't wait to see with it. And see if I can get some in my shop! Love this! Thanks for a chance to win. Hazel is so fresh and spring like:) Love it! Love the Hazel fabrics. I can't wait to get me some!! Your fabrics are as much fun as your blog! Thank you for sharing. Those are beautiful! Thanks for keeping boys in mind. :) Congratulations! Would be great to win this pretty bundle of fabric. I have boys too and love the blues! 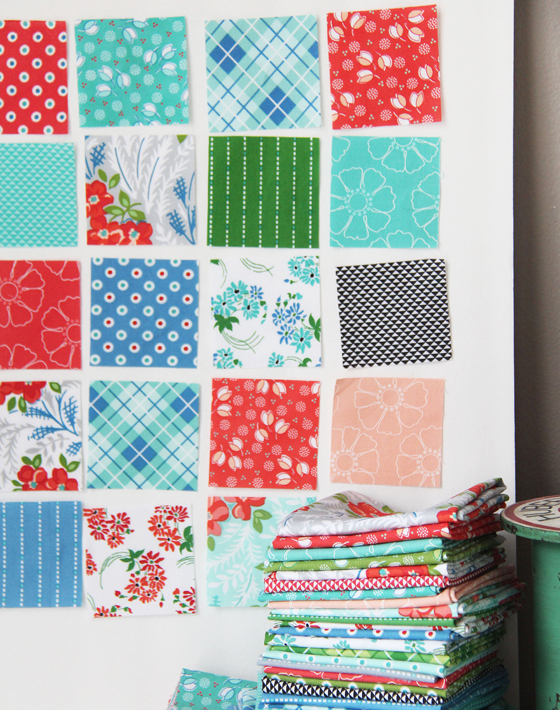 Such a happy collection…I share your love of many patterns in a quilt so can't wait for this one to be released. Love the diversity of your new line…and yes, the blues are especially divine! Lovely vintage look to this collection. I can't wait to see this fabric in my LQS. It is so fresh looking. Beautiful collection of fabrics, loving the color combo! BEAUTIFUL BUNDLE! THANKS FOR SHARING SPRING COLORS! Your new fabric line is beautiful and I can't wait to see what new quilts you are making with it. What gorgeous colors and patterns ! I love them all! I love the fabric line! You are a favorite blogger of mine! Thank you! Love it! Love it! Love it! Blue is my favorite colour too. Love the picture of the boys! I have two boys and sewed for them a lot when they were younger (both grown now!) Love your fabric line! Great bundle full of fresh colours! Beautiful prints and colors…love your collection!! Gorgeous fabrics! Thanks for a chance to win! Love the new fabric line and especially the plains !! I would ADORE being chosen as a winner !! I LOVE HAZEL! It speaks to my vintage heart! Congratulations on a gorgeous fabric line! Wish I was on instagram now! Oh my goodness this fabric is awesome. I just love it. I can't wait until it comes out! these are lovely fabrics. perfect for spring and summer and a little pick me up in the fall and winter. you have some very handsome young men there. Thanks for the opportunity! Love the color combinations. What a lovely line of fabrics! Thanks for the chance to win! What a beautiful fabric collection! Congratulations! Oh my Goodness, Allison, I'm loving Hazel! CAn't wait to get my hands on some! Thank you for your creativity! I'm curious about the name Hazel. Is this collection named after a loved one? I love the blue prints too! This collection is gorgeous! Thanks for the chance to win! What a gorgeous collection – I'm sure it will be a big success for you. Beautiful!! Can't wait to see it in person in August. Those florals are definitely making it into my stash and the dotty stripe is wonderfully versatile. I would love to win this bundle – thanks so much! Beautiful fabrics. You are so talented. Eager to see your Hazel Quilts. Wonderful fabric! I would love to win such gorgeous fabrics! Oh my, such a fun collection. Thanks so much for the chance to win. I've been away from sewing and quilting for a while and it would be so wonderful to start back with such beautiful bright fabrics. What great fabric! These are my favorite color combinations! What a beautiful collection of fabric! I also love the blues in the collection….definitely my favs! What a happy, lovely line of fabrics! These are Gorgeous! Love the whole range! so fabulous! Thanks for the chance. Love this new collection as much as your last line! I'm really drawn to the bright greens! How lovely these are , and how special of you to give some away! thanks for your generosity! What a lovely collection! I am also drawn to clear bright colors like the blues and reds you have in this collection. I will have to contact my LQS owner to make sure she is getting this line. It is lovely. LOVE these fabrics! Thanks for the opportunity to win! I love the ties and the fabric is uber cute! Love the colors and would love to win this giveaway. Thanks for the chance! The blues are great, but the greens! Swoon! Love it! Pretty fabric. Love the pic of your boys, what a good sport even though it was shorty and stumpy. I like the shade of blue you are mixing in with the aqua, red and green- I think it makes it more unique! Such happy colors! It's a dreary, gray day here, so thanks for brightening a few minutes of it! Very pretty fabrics. Cute boys. Lovely line! I can't wait to get a chance to play with it. Love this collection! Thank you for the chance. love the colors and saturation in this line! well done – congrats! Oh what a great giveaway! Those are fabulous colors. Thank you. Such a beautiful line! Love it! Love this collection! My favorite style of quilt is Vintage Modern and your new collection would make some very beautiful Vintage Modern quilts. Lovely fabrics and they share a name with a special great aunt of mine. Sweet! I love this fabric collection. Beautiful collection Amy. Well done! Happy Wednesday! What a pretty collection. I can't wait. Lovely looking fabrics in beautiful colors! Love the range in this line and the colours! What a beautiful line of fabric!! Thanks for the chance!! Darling, I can't wait for August! I love the blue too! Congratulations! This bundle is certainly one I'll buy. The name "Hazel" is special to me since it was my mom's name. She always said it was hard to find anything personalized with that name on it and it was true! She would be so pleased with the choices in this bundle. She loved color! I love those happy spring fabrics! And, I even love the name Hazel! I once knew a young girl named Hazel, she was something else! Full of spirit, energy and smart as a whip! Man that pillow is way adorable! I love it! Gorgeous fabrics! Would love to win for World of Charity Stitching. I think i am partial the reds! Hi, I am so thrilled to see the fabrics in your blog..am a new quilter and very much interested in the give away. Please count me in too. Such pretty fabrics and cute models too! Beautiful collection! I really love the colors you've used and the patterns will be so fun to work with. I love all the prints and colors in this line. Super duper cute. Thank you for the chance. What a beautiful fabric line! Im dreaming of the lovely quilt I would make with the fabric!! Congratulations on Hazel – beautiful colours and prints. Your fabric is delightful! I can't wait to see the quilts! Thanks for the chance to win. It's another gorgeous collection. I love the colors! Beautiful fabrics. Hope my quilt shop will be carrying it. HI I love Hazel! The colors and patterns are wonderful and the name, one of my favorites! Thanks for the opportunity! Love the collection. You have beautiful vision. Wow! Love those colors and patterns. It's a beaut! Beautiful fabric! Very fresh crisp colors. Love your fabric & patterns….pick me! I think my favourite print is the red with flower outlines. OOh, what I could do with such mixable fabrics! What great colours and prints. Congratulations and thank for a chance to win. Hazel is my sister's name and like her, your new line is gorgeous!! How pretty they are! I am especially drawn to the red and the aqua/turquoise fabrics. Way to go and thanks for the chance to win them. Congrats, these are beautiful!!! :) Also, I've been reading your blog since you were in Cleveland, and I can't get over how big your boys have gotten! Man, I feel old. Such happy fabric! Thanks for giveaway chance. Gorgeous fabric!! I'm seeing another quilt in my future. :) As always, thanks for the opportunity to win! Great patterns and colors. Love love. OMG! I didn't know you were on Instagram! I do check that more than my emails lol! I love this fabric and you guys there! You have such wonderful tutorials and stories and information! Thank you so much!!! Your boys ties are pretty cute! What a refreshing update of my favorite red, white and blue. I'm ready for the cool turquoise tones! Love the colors and prints! Love the new Hazel line! Ooooo!!! So pretty! And yay for fabrics that work well for boys too!!! I just had my first two sons (yes, twin boys after 3 girls!!!) last year and have been dying to make them a quilt but have had the HARDEST time finding good, coordinating, boy fabrics!!!! Love this!! What great fabrics! I especially like that it's great for both boys and girls! Love the vintage feel of the blues especially. Good job! Gorgeous!! I can hardly wait until August!! I will be saving my pennies! Love the mix of prints!! What a great new range Allison – congratulations. I love love love this collection! Absolutely love the skirt that you made. The fabric is beautiful!! This. Is. Gorgeous. Love it! Thanks for the chance to win! I think my favorite is the green plaid! Super cute! This collection is great. Love the blues and the florals. Congratulations on the fabric line! oh my gosh, I love these…. Very adorable. I don't think I could choose a favourite. I love these fabrics! Congrats on the new line! Delicious fabric line! Can't wait to see them in real life! Oh My Gosh!!! I love this collection. So Pretty. Love what you did with the kids clothes! OMG!!! This collection is so sweet!! I love the colours and patterns!!! Love these prints and colors!!! This is gorgeous! Would love to make a fun project with this! Thanks for the chance! i love these fabrics and so would my mom whose name is hazel. Your new "Hazel" fabric line is fabulous! Your color choices are fabulous! Would LOVE to win! you are so very talents…lovely line..thanks for the chance. Oh, how lovely! I love Clementine, and I'm kind of smitten with hazel! Can't wait to see it in person! I like the greys in your new line. Grey used to feel so modern, but you have found a way to make it feel vintage-y. Like the ties, I made bow ties for my boys, and the only one that would wear them was the baby (it helps he had no say, and couldn't figure out how to get it off). Happy sewing!! Love your fabric! Great collection. Oh my goodness, this collection is beautiful! I can't wait until it arrives in stores. Thanks for the chance to win. I' d love a little Hazel I'm my house! Congrats on all the hard work and the lovely new line!! The name of this one caught my eye because my daughter who was stillborn was named Hazel after my Grandma. My daughter would have been 17 on the 22nd of April. I think I'll have to make something special out of this fabric. i love the array of prints in this bundle. great giveaway! I love this! I made my first tie too short, too! Thanks for sharing…love the colors! I love this line of fabrics! Beautiful! Love the fabric collection and look forward to when it can purchased – great colors and combos! Thank you for sharing your cute patterns/ideas etc and for the chance to win! I can think of some very cute things to make with it! Absolutely beautiful collection! I adore the shades of blue especially. Thank you for the tutorials! Thank you for the giveaway. What a fabulous new fabric collection. I love every piece. Thanks for the wonderful giveaway. I love the colors and the prints. It is a beautiful line of fabrics. I may be too late for the giveaway, but just have to say how much I really like the bright and cheerful colors! 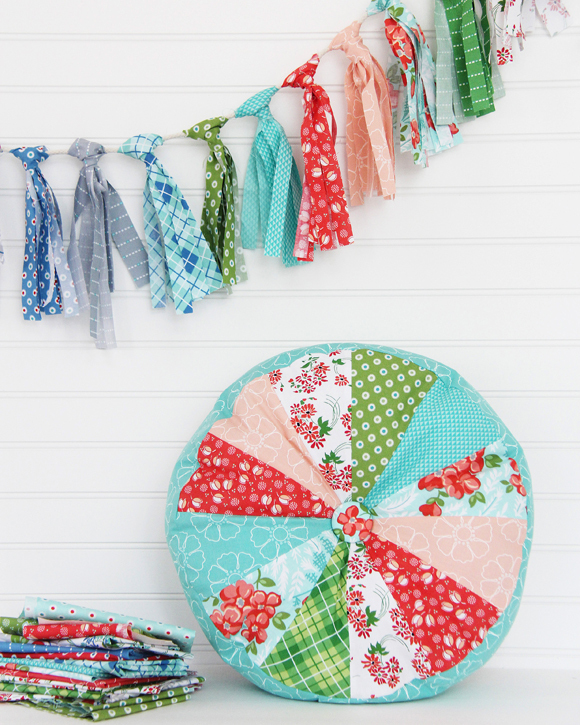 Very pretty fabrics, and adorable projects! Thank you! This is a beautiful collection! My mind is already swimming with project ideas! Thank you! Such a lovely collection of fabric. I'm very drawn to the greens right now. This is so beautiful! Being a little extra ambitious and HOPEFUL! ;) Thanks for sharing ! What a must-have for my sewing room! I love this collection, perfect! Beautiful fabric! Love those colors!!! Love that fabric. New to your site. Love it. beautiful collection to welcome spring. Thanks for the giveaway. :) This is a very nice selection of prints. Such a gorgeous range of fabrics – love all the colours especially red and turquoise together.